This rope ladder is 250cm long and perfect for children of any age. The rope ladder will fit onto any swing frame and provide hours of fun and play. The sturdy design and tough ropes means this product will last for years. Please select these from the drop down menu below. Price shown is for two swing hooks. 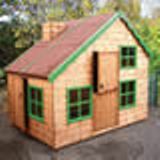 A Traditional Cabin shed 8'x8' (2.40x2.40m) in 12mm tongue and groove. An attractive and versatile storage shed. Traditional heavy apex shed 12'x10' (3.53x3.00m) in 12mm T&G cladding. Ideal heavy duty storage solution or garden workshop.